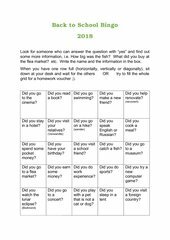 Grades 7-10 This bingo is meant to activate the pupils and get them to interact in the first lesson of the year. It works like "Find someone who" just in bingo format. Feel free to change some of the questions to suit your class.